In front of Whistle Stop Cafe. 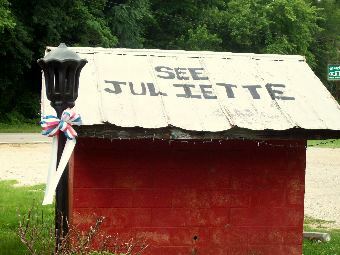 Juliette, Georgia is a fun place to visit. 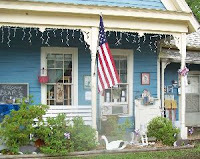 It's off the beaten path, quaint and charming. You may remember it from the movie Fried Green Tomatoes was filmed. When you walk along the streets here you are actually walking on the movie set. We did not get to eat at the restaurant because it was closed for the evening. Everyone we met was friendly and made us feel right at home. The book Fried Green Tomatoes at the Whistle Stop Cafe: A Novel by Fannie Flagg was the inspiration for the movie. Here, visitors to Juliette don't walk on the streets. They step into a movie set. 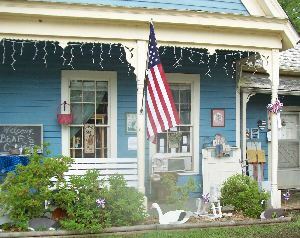 A welcoming building in Juliette. The charm of Fried Green Tomatoes is preserved in the charm of this small southern town. The locals were friendly and the shops are interesting. If you enjoy quiet places removed from the beaten path a visit to Juliette, Georgia may just be the place for you.